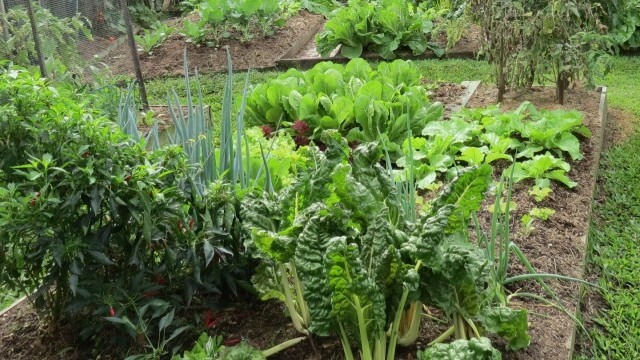 Over the coming months we are going to follow Mei Yin, a novice vegie gardener, as she creates her own productive patch and grows at home for the first time. I’ve wanted to have a vegetable garden for a long time, but didn’t quite have the right spot for it. One day my neighbour came around and told me that the original owner of the house (in the late 60s) had a very productive vegetable garden. We had an eight person spa in that location at the time. The thought of being self sustaining, being able to introduce the joy of gardening to my young toddler daughter and sharing the produce with neighbours eventually won me over. With my husband’s help we removed the spa, (he sold the spa on Ebay), filled in the hole with clean fill and placed two raised timber vegetable beds where the spa once sat. I partitioned each bed in the middle, which gave me four beds. Perfect for practicing crop rotation!. Around the edge of the vegetable beds, I included insect repellent herbs including Feverfew, Tansy and Pyrethrum. I’m hoping Rue will keep the friendly neighbourhood cats from being too comfortable in the vegetable beds. 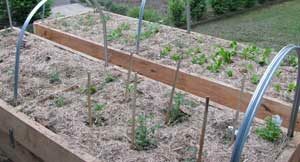 It took us a day on the weekend to put the sleepers together and fill them up with vegetable garden soil mix. And another half a day to plant the seedlings. Now that it’s all done…I can’t wait to see all the seedlings mature. I’ll update you in the next chapter. There is so much information out there among gardeners. We can all learn from each other. I’ll be keen to hear from anyone about their vegetable and ornamental gardens. I think SGA is keen to hear from all subscribers around the country on what they’ve done in their garden – big and small. Let us start sharing our stories. I made a start. Look forward to reading other subscribers’ gardening stories. If you would like to tell us your gardening story, go to https://www.sgaonline.org.au/?page_id=4859 for our submission guidelines and get writing.